A four-month old baby from England who was born with a “harmless” birthmark nearly died after the mark grew into her throat, almost cutting off her air supply. A four-month old baby from England who was born with a “harmless” birthmark nearly died after the mark grew into her throat, almost cutting off her air supply. Jasmine Midgley’s birthmark started to grow when she was about a week old. Her parents took her to the doctor who diagnosed the little girl with bronchiolitis – a mild respiratory infection that can be fought off with antibiotics. “I had my suspicions the birth mark might have been responsible for Jasmine's illness. We’d been told that it was nothing to worry about, even though it had spread all over her neck by this stage,” revealed Jasmine’s mother, Tanja Midgley. When she was 10 weeks old, Jasmine suddenly fell very ill and was hospitalised overnight at the University Hospital of North Tees. 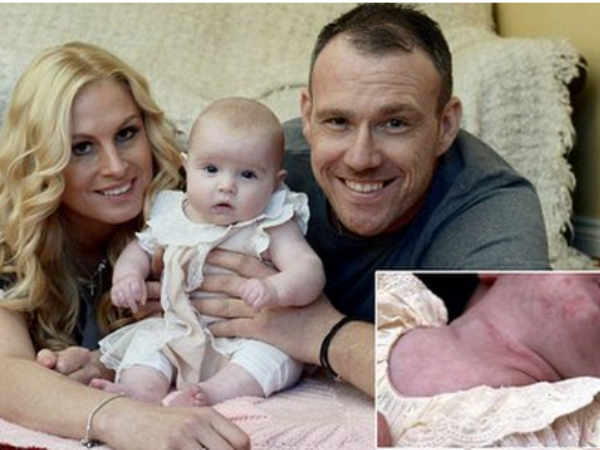 It was only then that a doctor noticed the birthmark on the baby’s neck was actually choking her. “We’d been told that it [the birthmark] was nothing to worry about, even though it had spread all over her neck by this stage,” said Tanja. The little girl was then diagnosed with subglottic hemangioma before being rushed to the Royal Victoria Infirmary in Newcastle, where she was given medication that shrunk the blood vessels in her neck. “It was an absolute godsend and gave us some normality throughout the ordeal, said Jasmine’s dad Steven Midgley. Subglottic hemangioma is a rare condition that can be potentially life threatening because of airway obstruction. Haemangiomas are benign tumors made up of blood vessels that can be on the skin or go deeper. I'm a 60 year old woman looking to meet men between the ages of 55 and 70.